Healthy Origins Ubiquinol (also called Kaneka QH) is the active "Antioxidant" form of CoQ10, responsible for the powerful preventive benefits associated with CoQ10. Normally, the conversion process from CoQ10 to Ubiquinol occurs naturally in the body. Supplementing with Ubiquinol is important for individuals who may have difficulty with the natural conversion of CoQ10 to Ubiquinol. Ubiquinol supplementation is especially important for: those suffering from specific conditions, especially related to oxidative stress: the middle-aged to elderly. For all other adults, Healthy Origins CoQ10 remains a vital supplement for maintaining a healthy lifestyle. All Healthy Origins Ubiquinol softgels are encapsulated in the USA using only Kaneka QH is produced exclusively in Pasadena, TX, USA, through a reduction process of CoQ10. Co-Q10, an important antioxidant found in high concentration in human heart and liver, is part of the cells’ electron transport system, needed for ATP (i.e., energy) production within the cells. Co-Q10 restores Co-Q10 levels reduced or depleted by use of statins. Coenzyme Q10 is a vitamin-like compound. It is an essential component of cells and is necessary for mitochondrial energy production. Years of research has shown that CoQ10 supports healthy cardiovascular and immune system functions in addition to its vital role in energy production. Coenzyme Q10 is present in almost all cells, where it is necessary for mitochondrial energy production. The body's highest concentrations of CoQ10 are found in the heart, where constant chemical energy availability is imperative. In addition to its benefits for cardiac function through energy production, CoQ10 also functions as a powerful fat soluble antioxidant, providing protection against free radical attack for vascular structures, as well as for other tissues, including the brain and neurons. Medium Chain Triglycerides, Gelatin, Glycerin, Ascorbyl Palmitate, Purified Water, Beeswax, Soy Lecithin and Annatto Extract. Contains Soy. Free of sugar, salt, starch, yeast, wheat, gluten, corn, barley, fish, shellfish, nuts, tree nuts, egg and dairy products. No preservatives, artificial flavors or synthetic colors. Q. What is CoQ10 and what is it good for? A.CoQ10 (Co-enzyme Q10) is a vitamin-like compound also known as ubiquinone. Ubiquinone combines two terms to describe this substance –quinone is a type of coenzyme and ubiquitous indicates it exists everywhere in the human body. CoQ10 plays an important role in the body’s energy production and is an essential component of the mitochondria, where it helps to metabolize fats and carbohydrates and maintain cell membrane flexibility. CoQ10 is also involved in the production of several key enzymes that are used to create ATP (Adenosine triphosphate), a key energy storage molecule. Without CoQ10, you would not be alive. There are two import forms of Co Q10, they are Ubiquinone and Ubiquinol. The first one is Oxidized form and second one is reduced form. Only the Ubiquinol (Reduced form) works as powerful Antioxidant. CoQ10 is also an effective antioxidant that may beneficially affect the aging process. As we age, our body’s production of CoQ10 declines by as much as 80%. Because it is so important to energy production, and therefore life, researchers believe that this decline may be a factor in the effects of aging on the human body. The highest levels of CoQ10 are found in tissues in the body that work the hardest; like the heart, the liver, etc. Initial studies into CoQ10 found that persons with cardiac insufficiencies had very low levels of CoQ10, and that supplementation increased CoQ10 levels. So CoQ10 is not only an effective antioxidant, but it supports cardiovascular health as well. Q.Why should I need to take coenzyme Q10 ubiquinol and not coenzyme Q10 ubiquinone? A.• In order to generate cellular energy, the body must first convert Coq10 ubiquinone into Coq10 ubiquinol. Without this conversion, the body's energy production process cannot be completed and energy levels cannot be sustained. We suggest supplementation of only the CoQ10 ubiquinol since it is the reduced form that your body uses and thus it does not have to be converted from the ubiquinone form into the ubiquinol form. As well, there is science that suggests that the conversion process is labored and difficult in the sick and elderly. Finally, since the CoQ10 ubiquinol form is 8 times more absorbable, the cost to suplement at maximum levels (300 mg of ubiquinol or 2,400 mg of ubiquinone) is considerably less with our Coq10 ubiquinol than with conventional Coq10 ubiquinone. • Ubiquinone and ubiquinol are both forms of CoQ10, and both are necessary to produce cellular energy. Ubiquinone is the oxidized form of CoQ10 that consumers are most familiar with; it has been taken as a supplement and studied for more than 30 years. Over the past three decades, CoQ10 has been recognized for its benefits to general health and wellness as well cardiovascular and neurological health. • Both ubiquinol and ubiquinone have vastly different roles to play in the body. For instance, ubiquinol is an electron donor, while ubiquinone is an electron acceptor. • The electrons that ubiquinol donates neutralize free radicals. This fact alone makes our Coq10 ubiquinol the form of CoQ10 that protects against toxic oxidative reactions in the body. This is particularly important is stroke and heart attack victims. • The chemical difference between ubiquinone and ubiquinol is that the ubiquinol compound contains two hydroxyl groups. These two hydroxyl groups enable ubiquinol to be more "hydrophilic" than ubiquinone, and thus much easier to assimilate. • The term "hydrophilic" means readily absorbable or dissolvable in water. The two hydroxyl groups on the ubiquinol compound result in its stronger bonding with water, which helps explain why it is so much more bioavailable than ubiquinone. • However, it is the reduced form of CoQ10 (ubiquinol) that has the ability to scavenge free radicals in mitochondria and in cell membranes, sites where free radicals inflict significant damage. The ubiquinol form of CoQ10, with its two hydroxyl groups, is what dominates in most human tissues. • Called a "coenzyme" because of its unique ability to participate in chemical reactions but remain at steady-state levels in the cell, coenzyme Q10 plays a central role in energy metabolism. CoQ10's ability to cycle back and forth between ubiquinone and ubiquinol accounts for many of its unique properties. This remarkable ability to cyclically accept and donate electrons, as well as to effect complementary chemical reactions in the mitochondria, accounts for CoQ10's unparalleled value to almost all life forms. 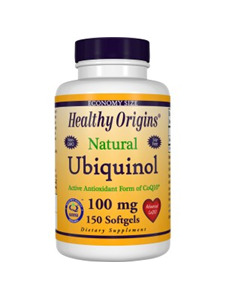 • Ubiquinol has a much greater bioavailability than the ubiquinone used in commercially available CoQ10 supplements. This is understandable, since ubiquinol has far greater water solubility and much better absorption into the bloodstream after ingestion. • To truly satisfy yourself, please study our reference sections of this web site. Q.What is the difference between ubiquinol and ubiquinone? A.Ubiquinone and ubiquinol are both forms of CoQ10, and both are necessary to produce cellular energy. Ubiquinone is the oxidized form of CoQ10 that consumers are most familiar with; it has been taken as a supplement and studied for more than 30 years. Over the past three decades, CoQ10 has been recognized for its benefits to general health and wellness as well cardiovascular and neurological health. In order to generate cellular energy, the body must convert ubiquinone into ubiquinol. Without this conversion, the body's energy production process cannot be completed and energy levels cannot be sustained. Thus, both are critical to sustaining your body's natural energy. As the body's ability to produce and reduce CoQ10 declines as you age, it is believed that those who are 40 and older or are affected by age-related health conditions may benefit from this pre-converted form of CoQ10 more than those who are younger. Q.Why should I be concerned about declining Ubiquinol levels? A.Declines in Ubiquinol result in less cellular energy and diminished protection against oxidative stress, which produces free radicals and can damage the body’s cells, including proteins, lipids and DNA. Ubiquinol provides a strong first-stage defense against this cellular oxidative damage and needs to be replenished to maintain optimum health. An increasing number of scientific reports indicate that dramatic decreases in ubiquinone levels and increased oxidative stress are associated with the aging process and with many age-related conditions. Q.Why does supplementing with ubiquinol become more important as you age? A.As a healthy 20-year-old, you readily produce all of the CoQ10 you can use and efficiently convert it into ubiquinol. In fact, the predominant form of CoQ10 in the plasma and tissues of a healthy individual is the reduced ubiquinol form. However, age and other factors can hinder the body's ability to produce and metabolize CoQ10. Some reports say this decline becomes apparent around 40 years old, although it can begin as early as 20 in some cases. As the body's ability to produce and reduce CoQ10 declines as you age, supplementation with ubiquinol becomes increasingly important for maintaining good health. Q.Where is CoQ10 made in the body? A.CoQ10 is produced primarily in the liver and then converted to Ubiquinol in the body through an enzymatic process known as the redox cycle which is short for reduction oxidation. CoQ10 must be "reduced" into Ubiquinol before it can be used in the body. Q.Why do I need to supplement CoQ10 if my body produces it? A.Yes. There are three major factors that lead to deficiency of CoQ10 in humans: insufficient dietary CoQ10, reduced biosynthesis, and increased utilization by the body. The literature is still inconclusive about whether biosynthesis or dietary intake is the major source of CoQ10. However, the biosynthesis is a multistep process requiring many other nutrients, and so a diet low in nutrients may lead to decreased biosynthesis. This implies that the 'normal levels' established now may be suboptimal, given the fact that suboptimal nutrient intake is almost universal in humans. Biosynthesis also can be affected by aging and certain medications (statins, blood thinners, etc.). Some chronic disease conditions (cancer, heart disease, etc.) reduce the biosynthesis and increases the demand for CoQ10 in the body. Recent evidences suggest that mutations in some genes also lead to CoQ10 deficiency. Products of these genes are thought to be involved in the metabolic pathway leading to CoQ10 production. To truly satisfy yourself, please study our reference and case study sections of this web site. Q.My doctor doesn't believe in CoQ10. Why? A.Unfortunately, most doctors in India are not familiar with the published research regarding the potential of CoQ10 because many of the journals they read rarely discuss the benefits of coenzyme q10. The reason for this is very simple, nutrients cannot be patented and as a result, there is no money in prescribing coenzyme q10. That's fact - not cynicism. So with no money to be made, there is very little interest to pharmaceutical companies and drug manufacturing laboratories, and these are the companies that sponsor and publish most of the journals read by doctors. The rest of the world has reacted completely differently to coenzyme Q10. For instance, Japan is the world's largest consumer of coenzyme Q10. In fact, CoQ10 is the fifth most commonly prescribed drug in Japan. Hundreds of scientific studies have been published on CoQ10, including many involving humans. CoQ10 has also been the subject of ten international scientific and medical meetings. Furthermore, the role of CoQ10 in energy production was basis of the 1978 Nobel prize in chemistry, given to Peter Mitchell, Ph.D.
Q.If CoQ10 has been available in supplement form for 30 years, why is Ubiquinol only recently available? A.Since Ubiquinol is easily oxidized in the air, it has been difficult to develop a stable supply in a reduced supplement form. However, using advanced technology, scientists have been able to perfect a stabilization process by which Ubiquinol remains in its reduced form and readily usable in the body. Q.How and when should I take CoQ10? A.CoQ10 works better if taken with fats and oils. Many CoQ10 supplements contain oils in the base and are sold as liquid filled softgel capsules. All forms of CoQ10 will work better if taken with a meal containing fats or with healthy supplements providing fat, such as fish oil, flax oil, coconut oil, etc. It is recommended to take CoQ10 in the morning taking it at night or late evening might cause difficulty in falling asleep. Q.What about the quality of CoQ10? A.We sells only the natural, 100% all-trans form of Ubiquinol CoQ10 that is produced using natural fermentation and purchased from the leading Japanese supplier. This is considered to be the best and most natural form available. Q.How long will I have to take Ubiquinol before feeling the benefits? A. Ubiquinol is not a quick fix for those looking for increased energy. Unlike caffeine or sugar which boost energy levels quickly and can cause a “crash” later, Ubiquinol offers sustained natural energy. Although each individual is different, it generally takes two to three weeks to restore optimal CoQ10 levels in blood plasma and tissues, most people will begin feeling the effects as their individual plasma levels start to increase, generally around the fifth day. Use it every day as my a must supplement regime along with Omega-3. I have been taking Ubiquinol 100 mg 2 softgels. This is because I am also taking statin drugs. From my experience Ubiquinol works very well to me and feel the benefits of it. My mother uses this product and she likes it a lot . Her blood pressure is also normal now. I read on this product and decided that since I was over 40 that this was a better option for me. This really worked out good for me. So here I am and although expensive this is what I plan on taking. It actually works and provides better energy for doing daily activities, specially for 40+ and seniors. I've got both my parents started on it and I can see the improvements. I will be ordering more. The best product for the price that I have found.